“The Imitation Game” is that rarity, an almost perfect film. The technical and scientific aspect will be satisfying to nerds and not so detailed to go over the heads of the rest of the audience. The acting is natural, believable and gets you involved with the lives of all the individual. Though it covers many serious subjects there are quite a few laugh out loud lines and scenes spring from the natural aspects of the characters. For those who never heard of Alan Turing he was an English mathematical genius who broke the German Enigma code and is said to be responsible for WW2 ending 2-4 years earlier than it would have. He also was arrested for being a homosexual in 1951 and was given the choice of prison or chemical castration. He was to eventually commit suicide though his mother contends that it was an accident. Benedict Cumberbatch as Alan Turing shows the man’s brilliance while at the same time shows that he wasn’t comfortable around people and offering all around him humor by his lack of social understanding. Keira Knightley as Joan Clarke the only female member of the group who worked on the Enigma code and accepts Turing proposal of marriage. Each member of the group are comfortable in their roles with Matthew Goode, described as a ‘cad’, a standout. Charles Dance, Mark Strong, Allen Leech, Rory Kinnear, Mattew Beard and Alex Lawther as the young Turing, all add to the strength of the film. The screenplay by Graham Moore is sharp, the direction by Morten Tyldum moves things smoothly along and handles the alternating between the three different time periods without any confusion. Right now Cumberbatch is the front runner for the Best Actor Oscar, deservingly so, and the movie is on many 10 best lists. Though I feel what makes it from being a perfect movie is how he was brought down in his life, his homosexuality, is sort of slighted from how/why he was caught and the society that made it a crime at that time. 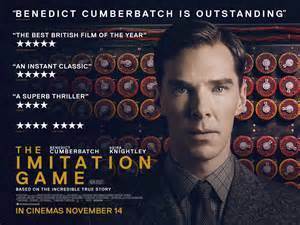 “The Imitation Game, is a must see movie for anyone who likes an intelligent, emotionally moving finely acted film.